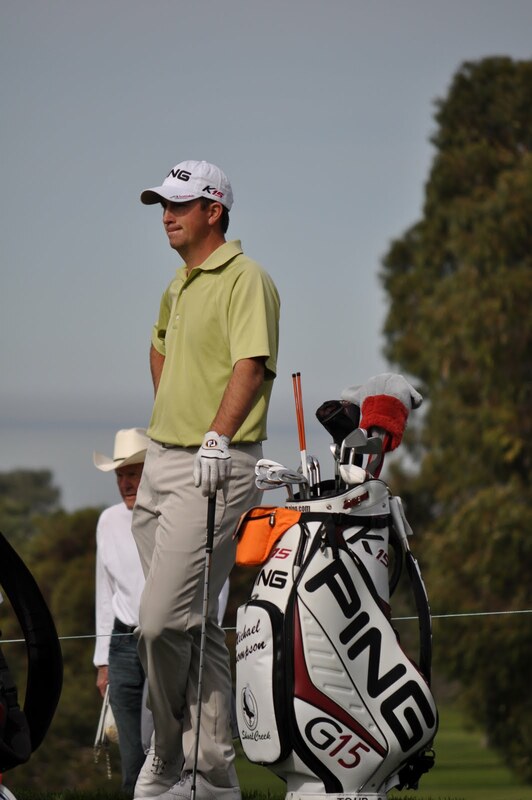 Michael Thompson made the cut at the Farmers Insurance Open, and went on to finish T-65. The finish got him into the earnings column and will help him maintain his position on the Rookie Reshuffle List. The list is a ranking system for the Tour's rookies which determines which order tournament invitations go out. By making the cut this week, it moves him up several spots from where he originally stood after Q School. The re-shuffle will occur after the Mayacoba Classic during week 6 of the season. He already has two additional guaranteed starts before the reshuffle: The AT&T Pebble Beach Pro-Am and the Mayacoba Golf Classic at Riviera Maya Cancun. He has this week off, and will be back at it in Pebble Beach the week after. 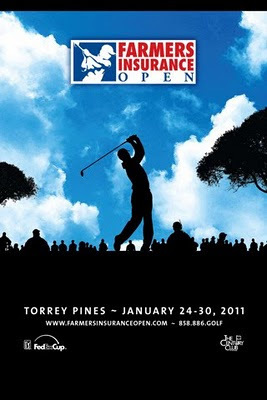 Round four of the Farmer's Insurance Open has just gotten underway at the Torrey Pines South course. Michael will tee off from the tenth hole today at 8:55am PT with Chris Couch and Martin Pillar. As usual, here are the links for all the online scoring pages that the PGA website has to offer. Those of you hoping for hole by hole Twitter updates may be a little disappointed with upcoming Twitter feeds because the PGA's "Mobile Device Committee" has mandated that there shall be no mobile device use of any kind except in the restroom areas. This mandate includes checking the leaderboard via web, texting, e-mailing, and above all Twitter Play-by-play. We'll continue to do our best. The third round of the Famer's Insurance Open was a day of ups and downs for Michael Thompson. Things got interesting early. After hitting his tee shot on the first hole into the right bunker, an awkward lie resulted in his second shot flying over the green and down the hill behind it. 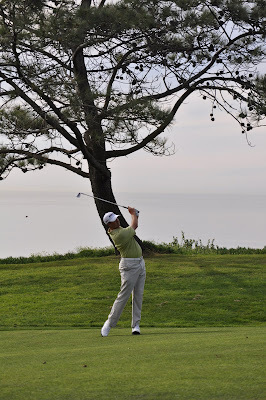 He then hit it over some Torrey Pines, all the way up to the green (about 20' of elevation change), and landed the ball within a couple of feet of the hole. We all shook our heads in disbelief. Unfortunately, he missed the putt and took a bogey. Nonetheless, it turned out to be one of several truly great iron shots of the day. Holes 2 through 6 featured great golf, with Thompson hitting fairways consistently and making solid pars and a birdie on 6. The 7th hole again proved troublesome after a tee shot to the sand lead to a drive landing in the fairway to the left side of and below the green. He made his second great iron shot of the day as he chipped it 5' up to the lip of the green and then have it roll about 15' to the hole and stop. He made the short putt to save par. More solid golf continued up to the 13th hole, where things started to unravel. On 13, Thompson hit a great shot from the bottom of the fairway all the way up to within 4.5' of the hole. The elevation change is hard to describe if you haven't seen it in person, but it's essentially like chipping a ball onto the roof of a 4 story building to a hole that you can't see. After staring down a 4.5' birdie putt for an unusually long amount of time, the ball traversed the lip of the hole and then decided to keep on going. Even though he made par, it began a downward spiral that lasted until the end of the round. On hole 14 Thompson went over the green yet again which he was visibly and audibly not pleased with, which is uncharacteristic for him. He was able to save par, but the confidence level was obviously slipping. Hole 15 could simply be described as a disaster, as he went from sand to rough, to 2 putt. From there on out things just got worse with missed putts and a trip to the water on 18. Although the day ended on a down note, up until the last four holes Thompson had been playing great consistent golf. He was hitting more fairways and making great pars. I think he'll be able to come back tomorrow and put the past behind. In the Sony Open, Thompson went from 10 over par in round one, to one under par the next round. History has shown he can come back from a bad stretch of golf, and I expect that tomorrow will be a great day for him. He also will have some extra moral support as his swing coach, Susie Meyers decided before the round this morning to come out for the final day of golf. Apparently she couldn't stand watching the scores on the internet and wanted to come cheer Michael on in person. Susie is an incredibly positive person and it will certainly help having her guidance tomorrow morning before the final round. P.S. Kudos to both Thompson and Bobby Gates who signed autographs for every single person who was waiting in line. Great class shown after a tough day of golf for both of them. Michael Thompson marked another important milestone in his young PGA Tour professional career by making his first cut at the Farmer's Insurance Open today. For any rookie, making cuts is job one. Now that he's made the cut, Saturday (known as moving day on the tour) is all about scoring and trying to move up the leader board. Michael finished the day at -5 for the tournament and tied for 17th. He shot a two under 70 on the North course which, despite scoring two shots easier than the South course, is playing harder than it ever has in the past. Torrey Pines has made a very deliberate effort to increase the difficulty on the North course by lengthening holes, narrowing fairways, and letting the rough get ridiculously deep. The final two rounds will be played on the South course. Michael's day got off to a rough start when he bogeyed two of the first three holes. On his fourth hole of the day (hole 13) he was buried in deep rough off the green around 15 feet from the hole. He made a remarkable chip out that not only got close to the hole but found its way home for a very improbable birdie. Throughout the rest of his first eight holes, Michael struggled to find consistency and ended up bogeying his seventh hole of the day (hole 16) and was sitting at +2 for the day heading into the par five 18th hole. He hit a great iron shot to reach the green in two and was able to make a tap in birdie to finish his front nine at just one over par. Michael took the momentum from that birdie and carried it into his back nine (holes 1-9 on the course). He birdied both holes 1 and 2 to card three consecutive birdies and get his round to one under par. From that point on Michael played very consistent golf with birdie opportunities on most holes and although the birdie putts didn't drop he had plenty of tap in pars. Perhaps his most wayward shot of the back nine came off the tee on his last hole of the day: the par five hole 9. His drive went right and ended up laying next to a cart path. A rules official was called over and Michael was able to make a drop in a thin piece of grass adjacent to the cart path. Unfortunately for Michael, his shot was blocked by a set of trash cans and a tree. That's when Michael pulled off an amazing low screaming fade that went over the trash cans, under and around the tree and managed to land in the middle of the fairway a mere 30 yards from the hole. He hit a nice wedge to within five feet of the hole, made his putt, and finished the round at two under par. Despite his early struggles, Michael was able to "right the ship" and even managed to move up five spots on the leaderboard. Michael will tee off from the first hole tomorrow at 8:20am PT with Jamie Lovemark and Bobby Gates. As usual, here are the links for all the online scoring pages that the PGA website has to offer. Shot Tracker should work tomorrow since Michael is playing the South course. The North course didn't have any Shot Tracker coverage so the link posted for today's round was probably worthless (sorry). Those of you hoping for hole by hole Twitter updates may be a little disappointed with upcoming Twitter feeds because the PGA's "Mobile Device Committee", also known as the Committee to Halt Progress, has mandated that there shall be no mobile device use of any kind except in the restroom areas. This mandate includes checking the leaderboard via web, texting, e-mailing, and above all Twitter Play-by-play. We'll do our best. Michael Thompson got off to a great start at this week's Farmer's Insurance Open posting a very solid 69 on the difficult Torrey Pines South course. The round was good enough to put him in a tie for 22nd. Tomorrow Michael will be playing the North course which has been playing about two shots easier than the South. Today's round was his first round in the 60's during his young 2011 PGA Tour career. Micahel jumped up the leaderboard early with back to back birdies on the third and fourth holes. His round wasn't all smooth sailing, however. He got into trouble on the 5th but had his "Save of the day" by holing a 15 foot chip from the rough to save par. He got into trouble again on the 7th hole when his tee shot went way left of the fairway and the ball landed near a hospitality tent, or as the shot tracker called it "297 yards to unknown". A rules official was called in for an official ruling and he was able to get a free drop since the tent was a non-permanent structure. Then, from the lands unknown left of the fairway, he had a nice shot to the green, 50 foot short of the hole, but close enough to save par with a two putt. After a par on the 8th, Michael drained a nice 21 foot putt for a birdie on 9 which was probably his "Putt of the day". The birdie wrapped up a very nice front nine at three under par with three birdies and no bogeys. The back nine started off solidly with a par on 10 followed by a great tee shot on the par 3 11th hole that landed 8 feet from the hole. He made the putt, putting him at -4 and again right at the top of the leaderboard. The par 5 13th hole proved to be difficult today as Michael's tee shot went far right of the fairway into some less traveled rough. Rather than laying up, Michael went for the green but came up short landing in a greenside bunker. As the ball landed in the bunker Michael was characteristically calm and simply said..."oops". He chipped out of the bunker to leave himself a 33 foot putt for birdie which he just missed and he tapped in for par. Michael's lone bogey for the day came on the very difficult 14th hole when his tee shot went into the right rough and then proceeded to get run over by a golf cart. A rules official was once again called in and Michael received a free drop. His iron shot from the rough flew the green and produced an unplayable lie. After he took a drop he managed to make bogey. The other golfers in his group, Michael Putnam (+4), and Brendan Steele (-2) also made bogeys on 14. Michael finished up his round with four solid pars and carded a three under par 69 which was just two shots off the best round of the day on the South course posted by three golfers including John Daly and Phil Mickelson. Michael tees off from the 10th hole of the North course tomorrow at 10:20am PT. We'll be out there again tomorrow. Make sure to follow us on twitter if you want quick summaries of the holes as they happen. After this non-by-lined story first appeared on www.rolltide.com it began appearing on many other on-line sources so we've included the original story here in its entirety because we think that its been published as a press release. If we are mistaken, we apologize, but we love the article! 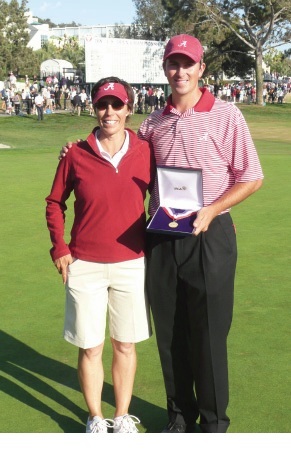 LA JOLLA, Calif. - Former University of Alabama standout Michael Thompson will be making his second official start as a full-time member of the PGA Tour on Thursday when he tees it up amongst the 156 golfers in the $5.8 million Farmers Insurance Open at Torrey Pines Golf Course. Thompson, who will be teeing off at 11:20 a.m. (CST), returns to the site of the 2008 U.S. Open where he earned low amateur honors following a tie for 29th place after rounds of 74-73-73-72 - 292. Since that time - some 956 days ago - Thompson earned full-time status on the PGA Tour in 2011 after finishing tied for 16th at last year's PGA Tour Qualifying School, was named 2010 Hooters Tour Player of the Year, Most Improved Player and won his first professional tournament, the Michelob Ultra Classic, in August. "Michael Thompson is all about integrity, hard work and he does everything correctly," UA head golf coach Jay Seawell said. "That's who he is." How Thompson arrived on the PGA Tour wasn't without its own trials and tribulations. After a stellar career at Alabama, including one of the best senior seasons in Crimson Tide history, he struggled initially after turning pro. A rough-and-tumble rookie season in 2009 saw him miss seven-of-14 cuts on the Hooters Tour and only place inside the top 10 on two occasions. Last year, though, was different. Thompson finished the 2010 season with six top-10 finishes, four top-5 showings and a win at the Michelob Ultra Classic at The Auburn University Club (in which his wife Rachel caddied for him). He lowered his overall stroke average by nearly a full shot and his first round average by 1.44, averaging 7.42 strokes under par per tournament in 2010. He racked up $92,853 in winnings and accumulated a tour-leading 3,865 points en route to Player of the Year. "I've always been a player or person that never likes to take major leaps in success," Thompson said. "I'm a person who really enjoys learning through my failures and that's part of life - you have to learn how to fail in order to succeed. It's the same way for me as it is in golf. There have been times where I've struggled. In 2009, I didn't have a great year, the first full year I was a professional golfer. I struggled a lot on the Hooters Tour but I got through that and in 2010 I had my best year ever. That wouldn't have happened unless I went through those struggles." After finishing the 2010 season, Thompson would head into the grueling six-day, 108-hole Q-School event full of confidence following his outstanding year on the Hooters Tour. During his week-long stay in Winter Garden, Fla., Thompson said he tried to create the most relaxing atmosphere possible - traveling by himself, renting a condo by himself, trying to make every day, as he put it, "like I was coming home from the golf course." "My goal that week was to treat it as much like a regular event - at the time like a regular Hooters Tour event - as much as possible," Thompson said. "My routine for 2010 worked really, really well on the Hooters Tour, and I figured if I kept doing that I was going to be successful at Q-School too." He struggled initially, shooting rounds of 73 and 72 over the first two days, but rebounded on day three, shooting a three-under par 69 before firing a six-under par 65 on day four that vaulted him up the leader board. "I wasn't thinking about playing golf the way I knew how to play or the way I had played all year," Thompson said. "After the second day, I settled down and said "let's go be Michael Thompson and let's go play golf." That's when I really started to play the way I know how to play, started making a lot of birdies, and made very few mistakes and enjoyed it." Thompson closed with rounds of 69 and 70 over the pressure-packed final two days to secure a 16th place finish and exempt status on the PGA Tour in 2011, an accomplishment that even left the Tuscon, Ariz., native a bit surprised. "I was totally expecting to play on the Nationwide Tour this year," Thompson said. "But I'm thrilled to be out on the PGA Tour learning a lot. This year is going to be a learning experience and we'll see how it goes"
As his career begins to take flight, Thompson will lean heavily on his wife Rachel, who he calls "a whole support group just by herself who takes care of the emotional aspect of me traveling and playing," and his instructor Susie Myers. Myers, who also served as Thompson's caddie during the 2008 U.S. Open, has been his instructor since he was just 14 years old. "She's really my sports psychologist, golf swing instructor, life coach," Thompson said. "She's kind of all in one. We've got this relationship now we've built over the years where she knows exactly what I'm feeling when I'm talking with her about my round, what I'm experiencing and how I'm feeling." While it's not uncommon for most PGA Tour pros to have a separate sports psychologist, fitness trainer, golf instructor, short game instructor and putting instructor, Thompson has all of that in one, which as he says, "is really nice." "She creates the right response for me to hear so I can go out the next day and play well," Thompson said. "That's unique in that I have an all-in-one coach." Following this week's event at Torrey Pines, Thompson will play in the AT&T National Pro-Am at Pebble Beach on Feb. 10-13 and the Mayakoba Golf Classic at Riviera Maya Cancun on Feb. 24-27. How well he fares in those tournaments, as well as the upcoming Florida swing starting in March, will determine if Thompson will get to play in such big tournaments as the World Golf Championship events, FedEx Cup events as well as major championships. "I know what I need to do," Thompson said. "I need to have the attitude that I'm a great golfer, and I can go out there and compete against the best golfers in the world. I never had the opportunity before, so it's exciting in that sense that it's all new to me. But at the same time the golf is all the same. It's the same as when I played at Alabama, it's the same as when I played on the Hooters Tour. I just need to go out and play." Thompson, who was born and raised in Arizona, now makes his home in Birmingham, Ala., and considers the Southeast to be his home. Since graduating from Alabama with a degree in accounting, Thompson has carried the Crimson Tide banner high, adopting the Alabama Script 'A' insignia on his golf bag in addition to carrying a Big Al headcover on his driver. He is one of four Alabama golfers currently on the PGA Tour, and the first since Jason Bohn (2004) to qualify for the Tour. "Everywhere I go, wherever I play, I always get one or two 'Roll Tide's,'" Thompson said. "To be from a different state and to now be part of a community that the University of Alabama is, I had no idea how big the support was for the University and how many people love the University of Alabama. That made it really special and I'm really proud to be part of that community. I really just pray that I can represent Alabama the way it needs to be. It's a great institution, a classy institution and a really friendly place." Round one of the Farmer's Insurance Open at Torrey Pines is underway. Michael Thompson will be teeing off from the first hole of the South Course at 9:20 am PST. Michael's practice rounds have been very solid and as Michael said via Twitter "I'm hitting my driver well right now." Also, keep on eye on the Twitter feed since we'll be posting information live from the course. Sponsorship goes even further than just the players and the hosts of the tournament. Caddies can earn a little extra money wearing shirts, hats, etc from various golf vendors as well. If their player makes the cut, they get a little bit extra. Victor has been a caddie for 23 years. Originally from Venezuela, his brother is Jhonatton Vegas' caddie. Vegas won the Bob Hope Classic last week in his second start on the PGA tour and we're hoping a little Velasquez family Venezuelan mojo will rub off on Michael this week. If you see photos of player's bags they often have logos from a golf course on them. On Michael's bag there is a Shoal Creek Golf Club logo on it. 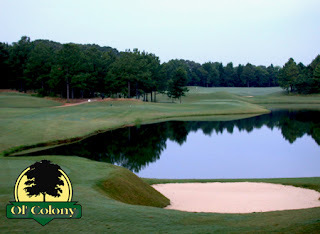 Michael was made an honorary member of the club, which is an exclusive and well thought of country club near his home in Alabama. Ever wonder how the "Shot Tracker" knows where the ball is when following scores on PGATour.com? Spread throughout the golf course, you'll see survey equipment in the television towers. Each tower has a surveyor sighting the ball with their equipment, which records the position of where the ball lands within a couple of inches. We've taken tons of photos from the practice rounds that we need to sort through and post in an organized manner. We'll be trying to do that the next few days. We're headed out Thursday through Sunday to follow Michael the whole tournament. Be sure to follow us on twitter for instant updates. The last couple of days for Michael Thompson have been filled with practice rounds on both the North and South courses at Torrey Pines. On Monday Michael played in a Pro-Am event on the South Course and yesterday he spent time on the North course. In the morning, Michael played nine holes with JJ Henry and Kevin Streelman. He capped his afternoon off with nine holes with Rickie Fowler. The general consensus among the pros was that the rough is thick and the course is long. This shouldn't come as a surprise since Torrey Pines has made a concerted effort to lengthen the course, especially from the black tees. Today is a day for Michael to take it easy before hitting the South course tomorrow at 9:20am. As usual, we'll be posting links so you can follow his round on the Internet. The Thompson Tide will be fully represented on the course following his round live and in person! Go Slick! While Michael Thompson was making his debut on the PGA tour at the Sony Open, The "Michael H. Thompson Bridge" made it's debut at the Ol' Colony Golf Complex in Tuscaloosa, AL. The bridge was a service project by two local high school golf teams to thank the golf course for it's support through the years. 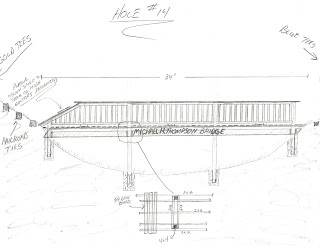 The 35' walking bridge connects the gold and blue tee boxes on the 14th hole and will make it easier for golfers to traverse a depression that conveys runoff to a nearby pond. Of the 24 student atheletes who helped build the bridge, 18 were from the Holy Spirit Catholic High men's and women's golf teams, and 6 were from the Tuscaloosa County High School Men's golf team. Coach Kevin Campbell from Holy Spirit Catholic High said the project was "a big hit" with the youth and from the pictures below, it looked like they had a pretty good time in the process. Naming the bridge after Michael Thompson was something that Coach Campbell wanted to do because "Michael's performance in the 2008 Masters exemplified the character we're trying to instill in our own golfers and because Ol' Colony was his home course while at the University of Alabama." 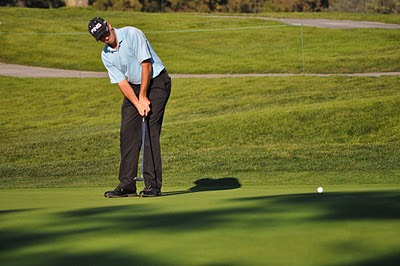 Coach Campbell was referring to an incident at the 2008 Masters (shown below) where Michael called a penalty on himself because the ball had moved after he had grounded his club, even though no one else saw it move. Q: "Let's go ahead and talk about it first: hole 15. Did the world see the Eagle Scout in you on that one? " A: Yeah. That's probably part of it. It's just something unfortunate that happened. But it's something that you've got to deal with. I had put my club down. I had completely addressed the ball and as soon as I put my putter down, the ball moved. And according to the rules, that's a one-stroke penalty and you try to replace the ball and you replay the shot. So that's what I did and I didn't make the putt. I was looking at about eight feet for birdie and ended up having eight feet for par. And I missed it and made bogey." Q: The TV announcers said no one may have ever even noticed it, but you immediately spoke up. If you had to do it all over again, would you still penalize yourself? A: "Oh absolutely. Every time. There's no doubt. No question. It's the rules of golf. You don't break the rules of golf. Especially in a setting like this it can always comes back to haunt you and, if not from someone else, it will always haunt you personally and I would rather live with me giving myself a penalty than I would with me cheating." In the end, Michael missed out on an opportunity to make the cut at the Masters, but he earned the respect of the golf community, and even ended up with a bridge named after him. Not so bad after all. 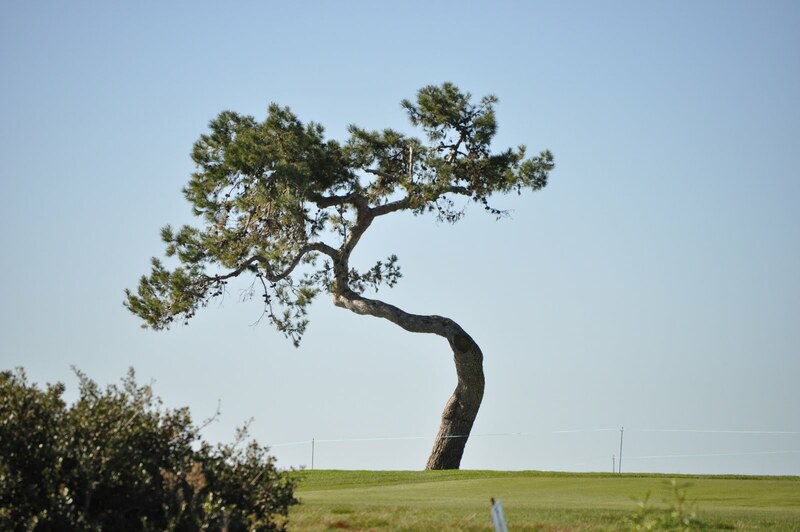 Over the years, Torrey Pines has been the host of many memorable golf tournaments, but none more so than the 2008 US Open. Most of the golfing world remembers the 2008 US Open at Torrey Pines as the tournament Tiger Woods beat Rocco Mediate in a 19 hole playoff on a bum leg (apparently, 18 playoff holes just weren't enough drama for Tiger). We here at The Thompson Tide remember that tournament for an altogether different reason: that was the US Open in which Michael Thompson not only made the cut, but finished as the top amateur, tied for 29th (notice that the 2008 US Open has its own page here at The Thompson Tide). meeting Susie Meyers and looking through her caddie notebook at the end of the week - boy was that some gibberish! But for me, one memory stands out above all the others. It came at the end of the tournament. Michael had finished as the low amateur and we were all waiting around for his medal ceremony. At the conclusion of the tournament a medal is presented to the low amateur during the trophy ceremony. We had been waiting in the players' dinning room for a while when a tournament official herded us out behind the 18th green as the tournament was drawing to a close. Tiger Woods was one shot back of Rocco on the 18th hole (a par 5). We all crammed around a little NBC monitor to watch the final hole. As most of you remember, Tiger made a really tough 15 foot downhill put for birdie to force a playoff. The crowd went nuts. Tiger went nuts. I went nuts - for about 2 seconds. As soon as we realized that Tiger had forced a playoff - an 18 hole Monday playoff - we knew Michael's medal ceremony wasn't to be. He had to hop a flight to play in his last tournament as an amateur (the Traveler's). He couldn't wait until after the Monday playoff for a ceremony. Asked by a tournament official what he wanted to do, Michael simply said that he had to leave and could they please bring him the medal. That official left for a while and then came back - with a whole lot of other officials all dressed in their tournament jackets. They asked us to follow them out to the 18th green. By then there were only a couple of people still in the grandstands - probably trying to wait out the inevitable traffic jam. On the 18th green, surrounded by mostly empty grandstands, they had a medal ceremony for Michael. I along with maybe 50 other lucky family members, friends, and fans got to witness it. It meant a lot to us that those officials went to the effort to give Michael the ceremony he had earned - even if it was just for us. Although I know I will be witnessing more ceremonies for Michael (either in person or on TV), I will always remember the 2008 US Open Low Amateur ceremony as something special . P.S. Susie wrote a really nice article describing her experience being Michael's caddie at the 2008 US Open. 5. A sleeve of golf balls you've signed sells for a minimum of $50. 4. The PGA website lists your name under players and provides your very own player page (see our previous post on 12/17/2010). Come on PGA, can we get a real photo this week? 3. A Google search for your name with the word PGA returns over 42,000 results. 1. The fan site that follows your career has a new masthead that simply refers to you as a "PGA Tour player." Sign # 6 "You're shown on the cover of a golfing magazine"
Sign #7 "The Golf Channel shows you playing golf"
A day after a very tough first round, Michael Thompson posted his first under par round as a PGA Tour professional. He managed to shoot a one under par 69 for the round, notching three birdies and two bogeys along the way. His round was highlighted by a 29 foot birdie putt on the par 3 eleventh hole and a 122 yard second shot on the par 4 sixteenth that he hit to within 39 inches leading to his second birdie of the day. Despite today's bounce back, Michael still missed the cut and so his 2011 Sony Open has officially come to an end. Next, he will be hopping on a plane and heading to Palm Springs where he is currently listed as the fifth alternate at the Bob Hope Classic. The field at the Bob Hope is only 128 players deep, unlike this week's field of 144, which is why Michael didn't automatically get in with his current rookie status. He, along with nine other golfers, will wait and see if enough competitors drop out to open up a spot in the field. 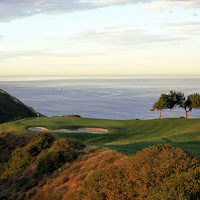 The Bob Hope Classic is an unusual tournament in that it is a five rounds rather than the usual four. That means the tournament starts on Wednesday so Michael will know fairly early in the week if he'll be playing in Palm Springs or headed south to San Diego to start practicing for the Farmer's Insurance Open at Torrey Pines which starts on January 27th. Well, today did not go so well for Michael. The scoop on the Waialae course is that it has narrow fairways and you pretty much have to hit them to have any chance at a good score. Looking at his scorecard statistics, he only hit 50% of his fairways, which you guessed it, led to a bad score. Looking at the 9 holes where he hit the fairway, he did ok, scoring 1 over par for those 9 holes. On the other end of the spectrum, the 9 holes where he missed the fairway he shot a collective +9. So, he's pretty much dug himself a hole that only a Chiliean rescue team could get him out of, but tomorrow is a new day, and next week is a new tournament... So how about if we all go home, have a drink, enjoy the family tonight, and agree to not talk about this day ever again. OK? All indications from Hawaii are that there will be golf today. Here are the relevant links for all you Michael Thompson followers. If your browser and internet bandwidth support it, I recommend the Shot Tracker feed. Not only does it provide data after every shot but it will give you conditions of where the ball is and how far it is from the hole. It also provides a nice graphic representation of the current hole Michael is playing. All good things come to those who wait - or something like that. Michael Thompson's PGA Pro Tour debut will have to wait 24 hours. Round One of the Sony Open has officially been postponed until tomorrow with plans for 36 holes to be played on Sunday. Judging by the photo on the left taken by PGA Pro Stuart Appleby and posted on twitter.com, they made a good call. I'm pretty sure there's a fairway under that lake. We'll be posting additional details regarding tomorrow's first round when they become available. Michael Thompson begins his first official day of work this year at the Sony Open, being held at the Waialae Country Club in Honolulu - that is, if the weather cooperates. Working outside does have a few disadvatages. If you've been following the Twitter feed coming out of Hawaii for the last couple of days you'll have noticed that the practice facilties were closed due to high winds and over two inches of rain. The Pro/Am event was also canceled. The forecast for today is only slightly better. "According to a Tour official, the weather expert says two-three inches are expected overnight and into Thursday morning. As of now, tee times are as stands, but it all depends on the weather. I’m told that some golf will be played, it’s just a matter of when." The official tee times and pairings came out the other day and Michael begins his first round in the ninth group of the day. He'll be teeing off from the tenth hole. Based on the current forecast, he should see some action even if he doesn't get his full round in. You Got A Question? We'll Get You a "Slick Answer"
On the right side of the home page, we have a spot for "Slick Answers". We'll be writing questions to Michael and when we get an answer, we'll post it here. The question could be serious, or silly. We'll swap them out occasionally, so make sure to check the website every once in a while. We have a few answers saved up, but we'll need more questions. So, if you would like to ask Michael a question, email us at randy@thompsontide.com or roz@thompsontide.com and we'll see if we can get a "Slick Answer" for you. Scott Stallings' blog over at bnet.com is worth a read. 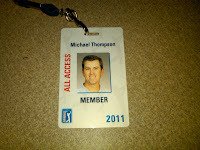 Like Michael Thompson, he is jumping up to the "big leagues" of the PGA Tour for the 2011 season. His latest installment is entitled "How I Prepared for the PGA Tour in 28 Days" and details the quick turn around from Q-School to the 2011 season opener - the Sony Open. Do You Have Your DVR Ready? As you should all know by now, this week Michael Thompson will be playing in his first PGA Tournament as a full fledged member - the Sony Open in Hawaii. The tournament runs Thursday through Sunday and will be televised on the Golf Channel. I fully expect you all to be watching live or at least have your DVR's programmed. Every fall, professional golfers find themselves on the verge of achieving the ultimate goal of becoming a PGA TOUR member ... with little room for error. There are the Nationwide Tour members who have played well enough throughout the year to contend for "THE 25" leading money winners finalized at the Nationwide Tour Championship, who earn their PGA TOUR playing privileges for the following year. There are the PGA TOUR members who battle throughout the Fall Series to secure their spot among the top 125 on the money list to secure their full exemption for one more year. And there are those who survive the initial stages of PGA TOUR qualifying with a chance to earn one of 25 exemptions handed out following the grueling six-round Q-School final. 'Ticket to the Tour' is scheduled to air on NBC Staurday 1/15 at 4:30p ET. (Check your local listings). 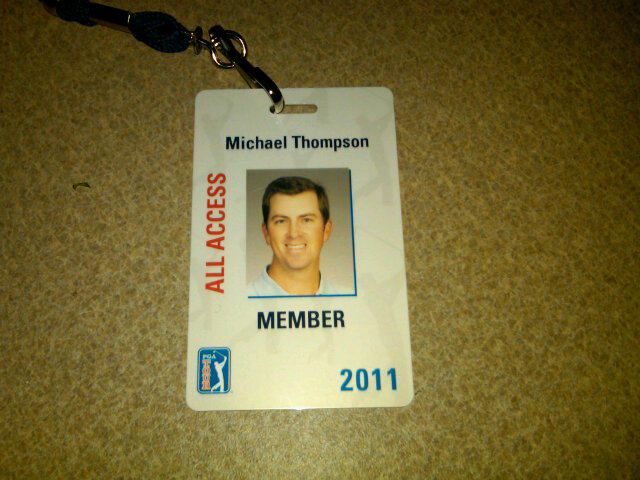 Myrtle Beach, S.C.- Monday, January 10, 2011 - Exactly one year ago, Michael Thompson (Birmingham, AL) was preparing for the NGA/Hooters Tour Bridgestone Winter Series event at Forest Lake Golf Club in Ocoee, Fla. My, how things have changed. After struggling through his first year on the NGA/Hooters Tour, Thompson found his stride in last year’s Bridgestone Winter Series, winning once and posting four finishes of T7 or better in eight events. The former U.S. Amateur runner-up carried that momentum into the 2010 NGA season, where he racked up six top-10 finishes, four top-5s and his first Hooters Tour win en route to Player of the Year honors. The former University of Alabama golfer stayed hot into PGA Tour Q-School, where he finished T16 to earn exempt status on the PGA Tour. His first start at the next level will come at the PGA Tour level, and it will start in this week’s Sony Open in Honolulu, Hawaii. 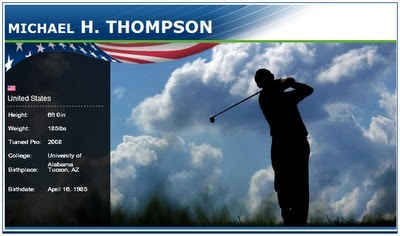 Thompson is also one of three former NGA Player’s of the Year in the event, joining Chad Campbell and Zach Johnson." 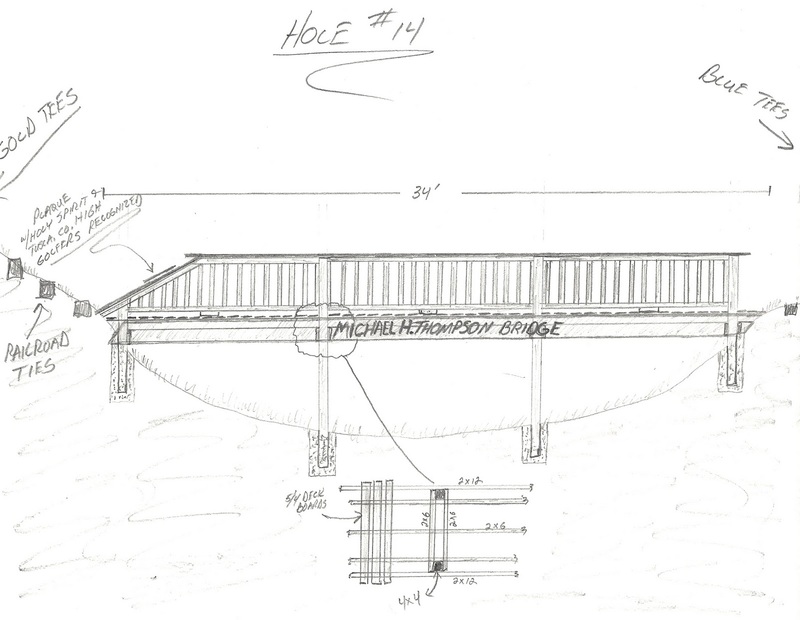 "My team would like to honor Michael by naming a soon-to-be constructed bridge after him at Ol' Colony Golf Complex. Because Michael's performance in the 2008 Masters exemplifies the character we're trying to instill in our own golfers and because Ol' Colony was his home course while at the University of Alabama, I would like his permission to place his name on this new bridge". "WOW! I know right where they're talking about adding that. It's a par 5 dogleg left. There's a creek or a runoff for water when it rains heavily. Right now you have to walk down and walk back up. I imagine they'll do a pretty good job. It'll make it easier and it will look nicer too." Michael Thompson played in the 2008 Masters as an amateur, qualifiying by finishing as the runner-up in the 2007 US Amateur. Standing right on the cut-line with only a few holes left to play, Michael called a penalty on himself when the ball moved after he had grounded his club, even though he was the only one who saw it move. The penalty came at a terrible time, and he went on to miss the cut. He received praise from the golf communtiy for his honesty and integrity shown that day. The response from others about the incident, has been positive. "After that happened I actually got a lot of mail from professors at Alabama or other schools and pastors at churches, that they used my example in their sermon that weekend. It was really cool." Construction on the bridge is set to begin January 15th while Michael is playing in his first PGA event after earning his PGA Tour Card. So you've just earned your PGA Tour card and you've got one week before your first PGA event of the year. What do you do? 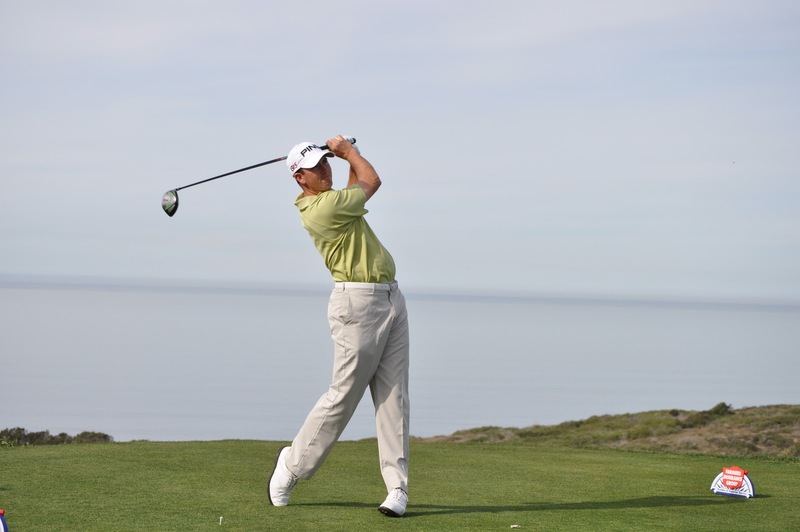 For Michael Thompson, he visited the Titleist Performance Institute (TPI) in San Diego, California. At TPI, he analyzed his swing using an array of sensors to determine any weaknesses in the swing or if there were any areas in which a long term injury could occur. They collect so much information during the process that it can be a lot to ingest, especially in a short visit, so Michael didn't travel to TPI alone. He was joined by his long time swing coach Susie Meyers who had wanted to take advantage of the TPI facilities to make sure she wasn't "missing something" with Michael's swing. Based on the initial reports, it sounds like she's been right on target and the TPI guys were duly impressed. In addition to swing dynamics, TPI focuses on a player's approach to the game of golf - everything from pre-shot routine to practice putting and chipping "games". They also analyzed Michael's range of motion and suggested workout routines to help him through the long PGA season. Susie and Michael will try to distill all the information they gained this week and apply the parts that will help Micheal's game without making him "think" too much. The TPI also helped custom fit Michael's shoes, gloves, and clubs. So did Micheal learn anything from his visit? The final report wasn't in yet but he did learn one thing that came as a surprise. He's been wearing the "wrong" shoe size! They moved him down a half size so we'll see how the new shoes work out next week. Susie Meyers teaches golf at The Lodge at Ventana Canyon in Tucson, Arizona.